The Wales forward arrived in the Spanish capital for a then world record fee of €100m in 2013 and was seen by club President Florentino Perez as the long-term replacement for Cristiano Ronaldo. "We keep looking at Bale because of his price tag and that has created this illusion that he's some sort of world superstar, but the last five years aren't reflective of what Madrid paid for him," Jorge Valdano, the former Real player and sporting director, said on Spanish radio station Onda Cero. 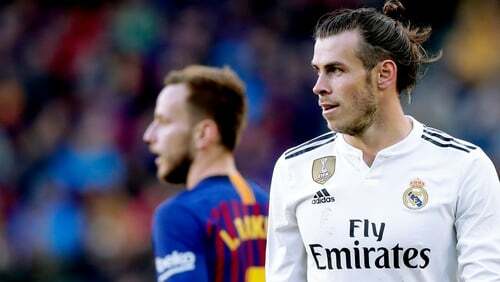 "Bale was the one in charge of tracking Jordi Alba [for Barcelona's first goal] but after seven minutes his concentration was gone. Alba was on his own down that flank. "At the start of the game, the players respected the system and their instructions, but then they do what comes naturally to them, like Bale did, and they think they have the authority to do whatever they like and that can go against the collective." AS newspaper cited Bale's failure to track Alba as the beginning of the end while Marca columnist Jose Felix Diaz suggested the 29-year-old went missing when his side needed him most. "It's not the day for blaming one player, rather all of them, but the Welshman was the one who was supposed to lead this side and show character but he just resigned. He looked like he couldn't cope with the stage or the pressure," Diaz wrote. "I wrote a few weeks ago that Bale was showing he had what it took to become the leader, that he hid when Ronaldo was around, but I need to take that back. He's picked up injuries and disappeared. His morale is fragile. It' a crying shame because of his incredible potential."